How will your achievements improve the world and define your legacy when you are gone? While these are hard questions for even the most mature adults, they are questions Emmanuel Akinjide poses to every high school student he mentors. "I want to help shape future generations by imparting the knowledge I've learned to them and making them think about their futures," he said. "This has been my path." A path he has walked for most of his life as a mentor and teacher. 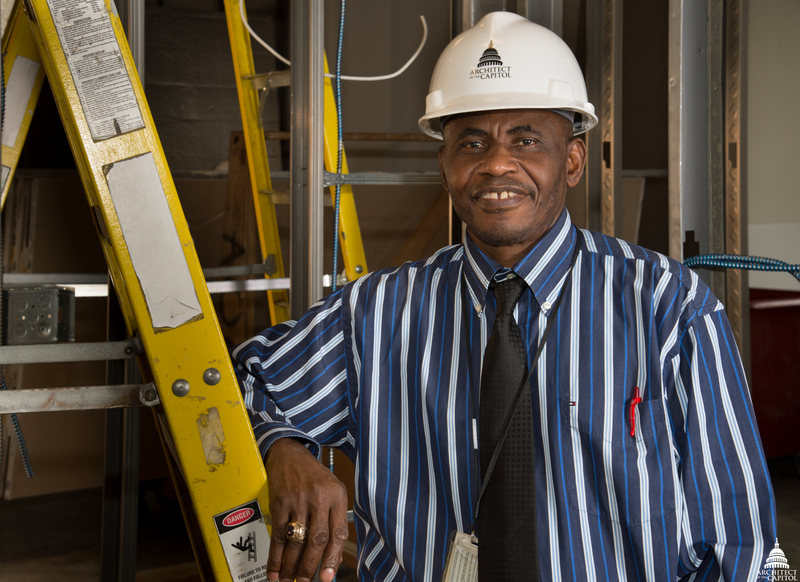 He now continues his efforts as a volunteer with the D.C. Public Schools (DCPS) Competitive Employment Opportunities (CEO) Program. This innovative, careerfocused mentoring program connects high school students with various disabilities to D.C.-area mentors who work in a variety of occupations. Emmanuel Akinjide recently began his third year as a mentor with D.C. public schools. Akinjide, an Electrical Engineer in Planning and Project Management and Robert Mitrocsak, a Jurisdiction Executive for the Capitol Power Plant and Office of Security Programs, are both entering their third year as mentors with the highly competitive DCPS CEO Program. There are thousands of applicants and only dozens of mentors. Each applicant is carefully screened and those accepted into the program are matched with a mentor working in their career field of interest. The program begins in January and ends with a graduation in June. For those six months, students attend class every two weeks to learn basic job skills. In the weeks between class, students work with mentors to apply what they’ve learned in a year-end project. With the help of their mentor, each student develops a project related to a career they are interested in pursuing. At the end of the program, students present their projects to a panel and those with the best presentations are awarded scholarships. Students are often intimidated by the thought of speaking in front of a large audience. One student that Akinjide mentored was so frightened by public speaking that he wanted to quit the program. "He said, 'I cannot stand in front of people. I'm going to drop out of the program. How am I going to do it?' and I said, 'That's why I'm here – to help you,'" Akinjide said. Thanks to Akinjide's patience and encouragement, the student stayed in the program and developed a business proposal for his year-end project. The student's presentation was a defining moment for Akinjide. "For a kid that did not have any aspirations, and goes from wanting to drop out of the program to finding the confidence to pursue a career in business – that moment serves as a powerful example of why it's so important to invest in the next generation." 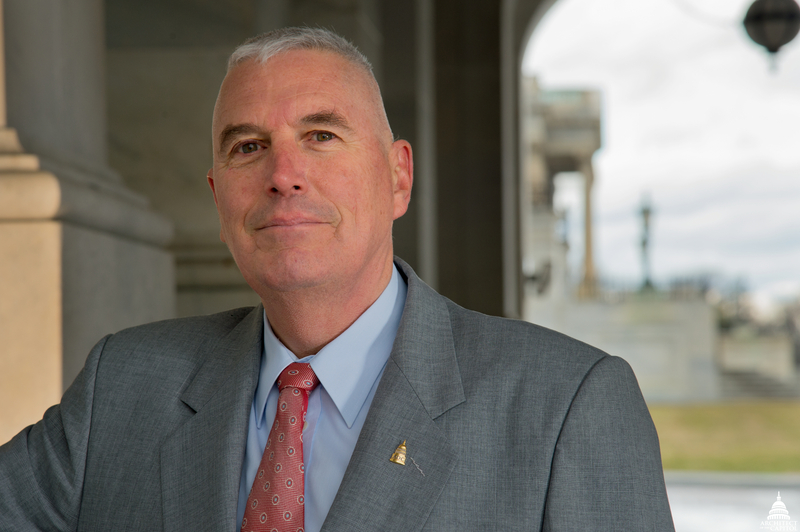 Robert Mitrocsak has mentored kids from D.C. public schools since 2013. Mitrocsak believes one of the program’s greatest benefits is the way it builds the students' confidence – a direct result of the presentation. "At the end of the day when the students have presented their projects, they've achieved a level of confidence that their peers have never experienced before. It leads them to see themselves in a different way and think, 'If I can do this, what else can I do?' And that’s what mentorship should do – it should always have a positive impact on students," he said. The program also includes a two week internship in the summer at the mentor's organization. Mitrocsak believes the internship is a good opportunity for students to get hands-on experience. "I assign them tasks, and we go on project site visits. Last summer we were working on the fifth floor renovation in the Ford Building. I asked my student to work with the other interns to take measurements of the room. I realize taking measurements isn't the most exciting work, but I think it's important for kids to understand you don't start out by designing the Louvre," Mitrocsak said. The internship allows students to see what they like about their potential career field and what they don't, which are valuable lessons to learn at their age. "At 15 or 16, I didn't know what the day-to-day life of an engineer was like. For these students to get a good, in-depth look is very helpful. They're in this program and they've learned so much by working on their projects. Maybe their views have changed and they've decided to go in a different direction – that's okay. That's part of the mentoring process – helping students discover who they are and their interest," Mitrocsak said. As volunteers with the DCPS CEO Program, the time commitment for mentors is not huge, but the impact they have on the students' lives certainly is. For Akinjide, the reason is simple. "When you mentor kids and help direct them to what they like, they will excel," he said. And seeing the kids excel is all the incentive he needs to continue his work as a mentor. "That's my motivation. I keep going back for those moments." 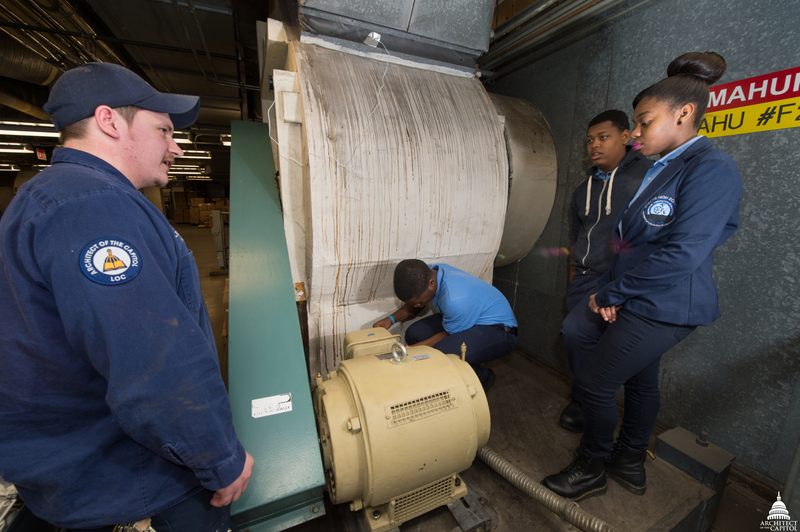 For more information on the DCPS Competitive Employment Opportunities Program and how you can get involved, visit dcpsceo.com. 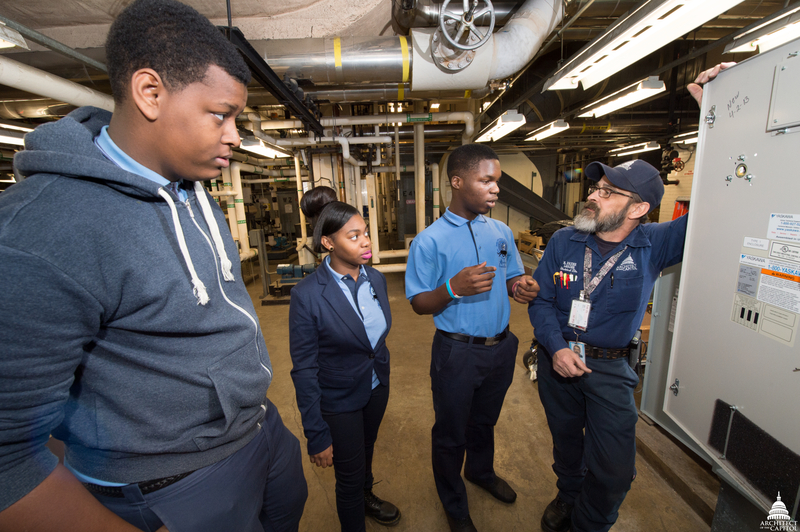 In addition to providing internships to the DCPS students, the AOC also partners with the Phelps Architecture, Construction and Engineering High School in northeast Washington, D.C. The partnership provides an opportunity for minority and female students to learn more about occupations that are in demand at the AOC. The AOC often hosts the students at the Capitol campus. Most recently, the AOC held "Engineering Shadow Day" where students were able to shadow AOC employees from several jurisdictions, including: Library Buildings and Grounds, Planning and Project Management, House Office Buildings, Senate Office Buildings, Capitol Building and the Information Technology Division. Phelps students spent the day with AOC mentors learning more about the work they do. The event was deemed a success as positive emails filled the inbox of Ed Lopez, Equal Employee Opportunity Specialist and coordinator of the Phelps Partnership for AOC. "Thank you for inspiring and enriching the lives of our students. You have made a difference! We are very grateful and proud to have you in our corner as we educate these students." "Thank you all who participated in this event. It was an overwhelming success and the students had truly amazing experiences. As one kid said, 'It was the best day of my life.' Thank you for taking time out of your day to mentor the students and organize this event."